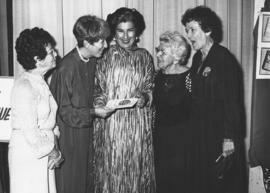 Photograph depicts five unidentified members of the Beth Israel Sisterhood. 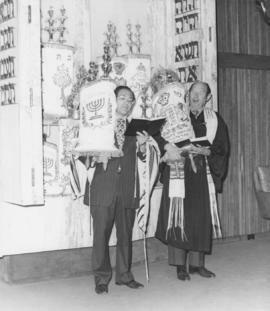 Photograph depicts Rabbi Wilfred Solomon and Cantor Murray Nixon with the Torah. Photograph depicts Rabbi Wilfred Solomon and Cantor Murray Nixon standing in front of the Aron Kodesh (Torah arc). Photograph depicts Cantor Murray Nixon on the bimah. Photograph depicts Rabbi Wilfred Solomon on the bimah. Photograph depicts Rabbi Wilfred Solomon and Cantor Murray Nixon on the new bimah. Photograph depicts a large choir singing. Photograph depicts a few people in the Beth Tikvah choir. Photograph depicts a woman at a podium with the choir seated in the background.